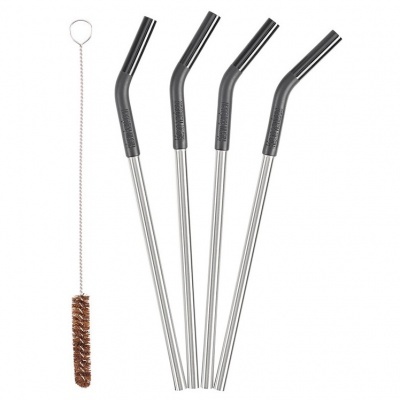 A set of 4 stainless steel straws with a plant-based cleaning brush (plastic-free & vegan) by Klean Kanteen. The straws are made of high quality 18/8 stainless steel with a safe, food grade, removable silicone flex tip. Klean Kanteen developed the 5 Piece Stainless Steel Straw Set to save the planet from plastic straw waste and as the perfect accessory for the 16oz or 20oz Insulated Tumblers and Steel Pint Cups. Whether you're drinking smoothies, pressed juice or iced coffee, Klean Kanteen straws make sipping safe and easy. 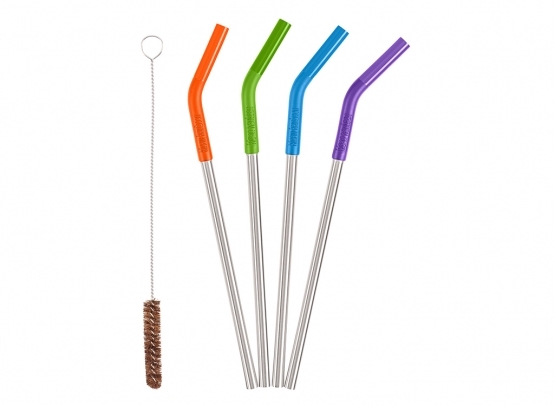 Straws are made from high quality 18/8 stainless steel with a safe, food grade, removable silicone flex tip. This set comes with a plastic-free, plant-based Straw Brush. The brush is made of 18/8 stainless steel and natural palm fibre bristles to make it easy to keep the straws maintained, clean and easy to go from smoothies to coffee to water. A great solution to single use straws!